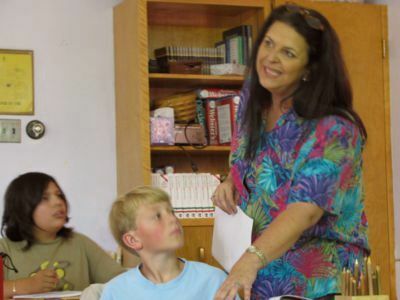 Our students start at a very young age using Spanish in daily conversation with the teacher. This approach creates a low stress environment in which students are given opportunities throughout the day to use their oral skills learned in class. In addition to oral practice, instruction is integrated with music, movement, and art. 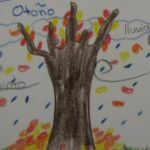 Vocabulary is increased year by year, and opportunities abound for students to learn about various Spanish-speaking cultures as well. In the upper grades (6-8), note-taking strategies are incorporated into the learning process. Students start building their portfolios and notebooks, filled with resources that they take with them to use in high school. Ms. Munoz works closely with the local high schools to help students realistically assess their Spanish skills. Many of our graduating eighth graders test into Spanish II, granting them three credits for Spanish I.
Ms. Munoz works with students, clarifying grammar and pronunciation.